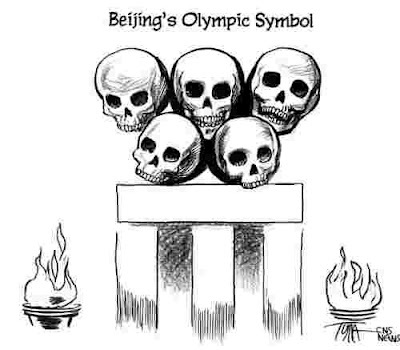 Pro-Tibet demonstrators have tried to hijack the Beijing Olympic torch lighting ceremony in ancient Olympia. In globally televised ceremony to mark the start of a five-month torch relay, the actress Maria Nafpliotou playing the high priestess used a break in the clouds to light the torch in front of the Temple of Hera. However, just before the torch-lighting ceremony inside the archaeological site that played host to the Olympics in ancient Greece, a few demonstrators tried to break a tight police cordon. One of them, unfurling a banner, managed to approach Beijing Games chief Liu Qi during his speech in front of hundreds of officials but was taken away without reaching him. This is only going to grow and grow, the Chinese have completely underestimated the fury their occupation has created, and of course the fury their support of dictators around the world has created, it is going to be a long white hot summer as more and more pressure builds – what if the Chinese are caught on tape of butchering civilians in vicious clamp downs, can Helen really still sign up? Could John Key pull the rug out from under Helen Clark by declaring after such an incident that he will not sign a deal with a regime killing it’s own people, leaving Helen high and dry? Internal ramifications to one side, the Chinese have had this protest coming for a long time, watching them squirm through their wax work party member expressions as the rest of the world point out their crimes is immensely satisfying.